The aim of the 5x5x5 group mentorship program is to provide partnership and develop productive dialogue across all members of the architectural community. Adding value to AIA Membership, the 5x5x5 program creates a peer network of engaged professional sand stimulates intergenerational and interdisciplinary dialogue. 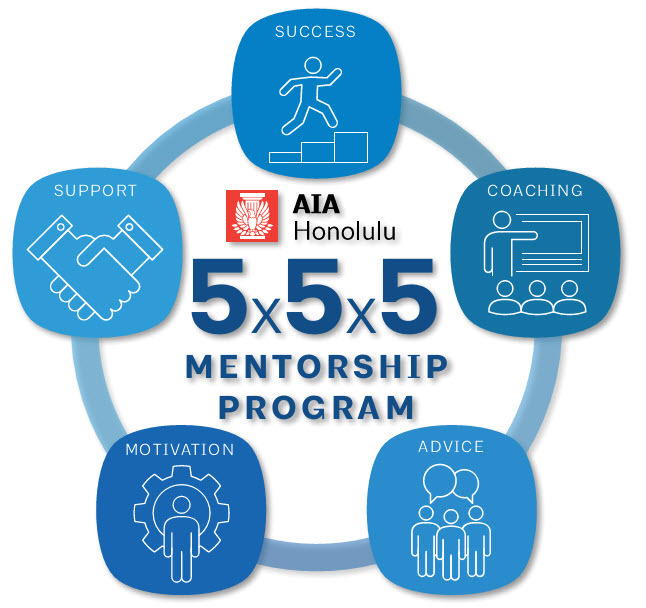 Participation in this program adds value to personal career and leadership development for the rising generation in the architecture profession and fosters and continual learning to promote the Hawaii architectural community at large. View program information sheet. FIVE MENTORS – Industry leaders involved in promoting the built environment through their work, research, writing, etc. Each Mentor is chosen for their expertise and ability to engage emerging architects and AIA members. Mentors provide a unique outlook on the field of architecture and bring to the table a specific set of interests and experience. The Mentors range from non-traditional architects, community leaders, academics, industry-related business leaders, and architectural practitioners. FIVE LEARNING GROUPS – Each learning group consists of 5 mentees and 1 group coordinator. The learning groups are open to all levels of the professional practice: unlicensed emerging professionals to licensed seasoned professionals. A Team Coordinator will be assigned to each learning group. The Team Coordinator serves as the point of contact between the group and the mentors, helping to coordinate group sessions logistically as well as facilitate discussion during their meetings. Groups are divided equally based on experience, gender and career goals in order to provide a variety of perspectives and interests in each group. FIVE MEETINGS/YEAR - All learning groups will agree on their own meeting schedule (once every two months) throughout the year. Each mentor will rotate throughout the groups until they have met all five groups. PROGRAM COST - $50. Price includes five mentorship sessions throughout one calendar year. QUESTIONS? Email AIA Honolulu or call us at (808) 628-7245.